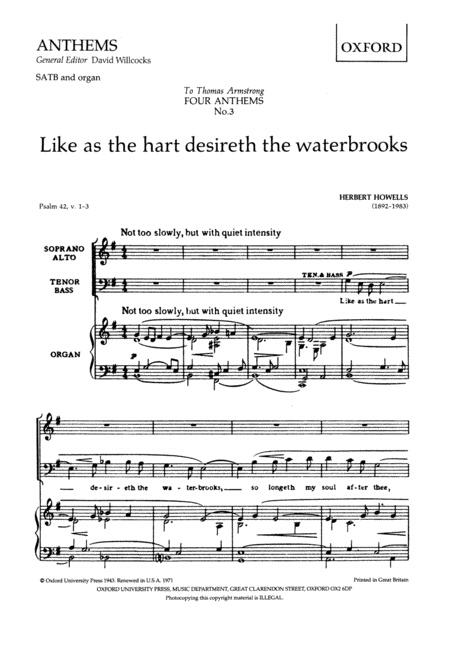 Composed by Herbert Howells (1892-1983). Mixed Voices. Sacred, Choral Leaflet. Vocal score. 8 pages. Duration 5'. Oxford University Press #9780193501638. Published by Oxford University Press (OU.9780193501638). ISBN 9780193501638. 10 x 7 inches. Great. Just what I wanted and expected. 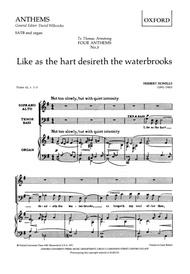 February 26, 2010 A Howells Anthem Not To Be Missed. year, it would be "Like as the Hart". This is a work of longing and timeless beauty, and more than worth the effort for choirs to add to their repertoire. This piece was sung by 300 voices from around the Episcopal Diocese of Maryland on June 28, 2008 on the occasion of the consecration of the XIV Bishop of Maryland. The venue was National Cathedral in Washington, DC. The bluesy character of the piece was fitting in this instance. I had to have this piece of music to pratice for and perform at the Consecration of the Episcopal Bishop of Maryland. Sheetmusicplus got the piece to me in a timely manner. Thanks A lot.